Flickr case studies: we currently have 2. This clever little marketing campaign created a 13% sales boost for a small book shop in Switzerland. With more travel research being conducted online, the Travel Book Shop highlighted the limits of the internet with a video showing a crashed Google Streetview car- generating plenty of buzz in the process. Worth harnessed the burgeoning power of social media to improve the UK public’s support and awareness for Armed Forces Day and encourage a celebration of the forces, veterans and wider forces family, to honour the work they do. Worth's use of digital to create highly engaging content and development of spaces where communities could grow and flourish has allowed them to mature into meaningful places of support and an overall increase in positive participation. 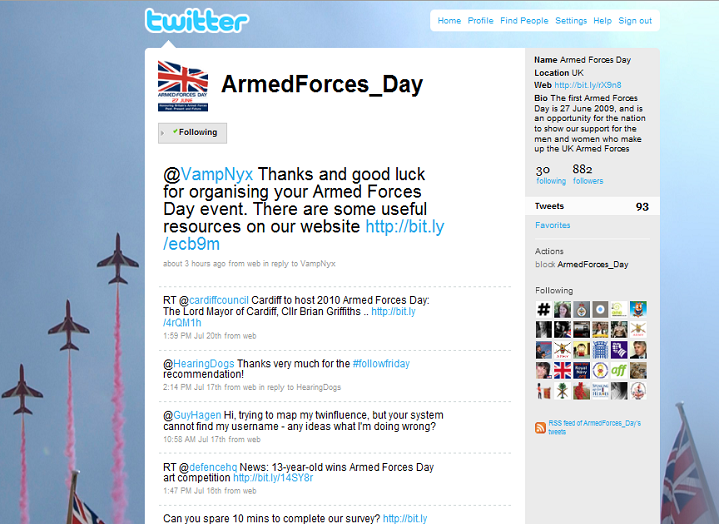 Post campaign research has shown www.armedforcesday.org.uk had over 180,200 website visits between 1st April and 7th of July 2009. There was an unprecedented growth in the Facebook fans from 4,000 in late May to just over 100,000 by 26th June, with a joining rate of more than 3 people per second up to the 100,000th membership. The membership rate continues to grow, soon to reach its 200,000th member. Nearly 13,000 people signed up to the AFD mailing list – with over 9,000 receiving free window stickers to spread the campaign message further and over 6,000 leaving a message of support. Further, 6,295 photos were uploaded into the Flickr photo gallery by fans from 2009 events.